Size of this preview: 800 × 532 pixels. Other resolutions: 320 × 213 pixels | 640 × 425 pixels | 1,024 × 680 pixels | 1,280 × 850 pixels | 6,126 × 4,070 pixels. 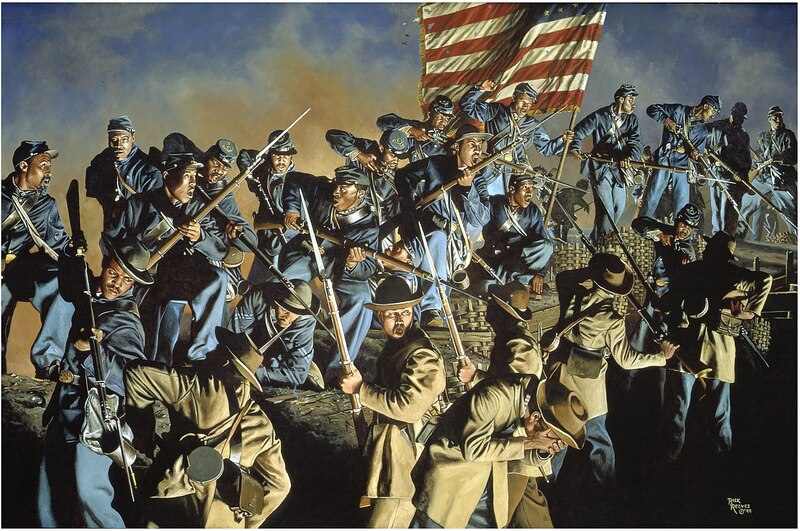 The painting The Old Flag Never Touched the Ground, which depicts the 54th Massachusetts Volunteer Infantry Regiment at the attack on Fort Wagner, South Carolina, on July 18, 1863. This image or file is a work of a U.S. National Guard member or employee, taken or made as part of that person's official duties. As a work of the U.S. federal government, the image or file is in the public domain in the United States.